I've been running for a few years now. I am not a professional. I run for fun, to relieve stress, and to keep fit. Through the years though, I guess you can say I've picked up some pointers. Some tips have been handed down from other runners, but most I figured out for myself. 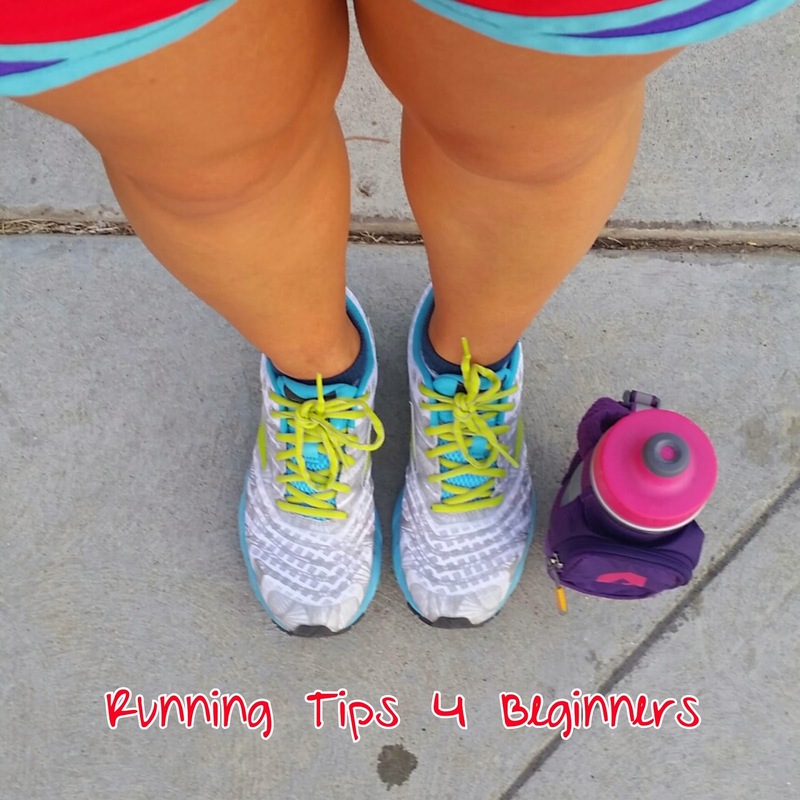 Here are some running tips for beginners. Invest in a good pair of running shoes- I mentioned the importance of getting the right shoes in a previous post. I highly recommend taking the time to get your feet properly measured. Your running shoes should fit like a glove and be perfect for you. This helps with injury prevention. Build your mileage gradually- If you set out to train for any type of running race, make sure you slowly increase your mileage in order to prevent injuries. The most common injury that occurs when over training is shin splints. Rule of thumb is to increase your mileage by 10% each week. Keep a training log- When I did my first race I learned the importance of keeping a running schedule. I logged every mile, cross training day, rest day...you name it was jotted down on my log. It allowed me to keep myself accountable for my runs. If you have an excellent memory then that is fabulous for you. I like to see everything in writing; all of what I have accomplished. It keeps me motivated to see all that I have achieved. Set small achievable goals- I have made sure through the years to make my goals realistic. I still have to work for them but dividing them up makes them so much more attainable. If you set yourself up for failure, why would you want to continue with running? You don't always have to go for a PR (personal record)- This one was pretty hard for me to grasp. In the beginning, every race I was signed up for resulted in a PR. My honeymoon period lasted for about two years. Then I couldn't for the life of me break my previous times. I started to dread races. I had to remind myself what the real reason I started running was for. I have good races, bad races, and some races that are just for fun. Not every race is the same so as long as you understand that early on you should be fine. It is okay if you have to walk- Not everyone has the ideal running body with the gazelle legs and the perfect lungs. I am short with athletic induced asthma. It takes me 2-3 steps for a tall persons single stride. It is quite pathetic really when I am running next to a tall person. It looks like I am sprinting while they are just out for a leisurely jog. So it's no surprise I seem to tire easier. At first I had this rule that I would not walk under any circumstance. I feared that if I stopped running my body would just tire out and not want to start again. Luckily this is not true. Once when I was running an uphill, a person was walking faster than I was running. It was like a total eye opener. After that I started walking when I knew my pace was slower than a fast walk. This allows me to recoup and re-energize. My breaks are no longer than 60 seconds. Run on trails as often as you can- In a previous post I listed the importance of trail running. Running out on different terrain is so much better on your joints and knees. Plus you get to see beautiful scenery and breathe fresh air. Make sure to properly fuel for long runs- When I first started running I would just go out on a run not properly hydrated and with an empty stomach. I would "hit the wall" so fast. It was no wonder I felt like crap during and after my long runs. Now I make sure to at least have a banana and carry my hand held water bottle for any run. I also fuel during my runs with gels. Be cautious of these gels though. They may upset your stomach and have you running for other reasons. It is not all about running- Make sure to schedule cross training days. I take Zumba classes, spin, and weight lift to counter balance my running. Your body will love you for this. Try to run with friends- At first I hated running with people. I felt like I was either going to hold them back or vice versa. It wasn't until a year ago that I finally broke down and agreed to run with a friend. Now I wish I would have done this sooner. Running friends are your greatest motivators! They inspire you to to better. Try to join a running group near you. Yes there will be people faster and slower than you, but you will still reek the benefits. Listen to your body- If your body needs a rest, maybe you need a rest day. If you are having knee pains, maybe you need to lay off running for awhile. It seems like common knowledge, but you get caught up in your training and forger to listen to your body. There is such a thing as over-training. It leads to injuries, sleepless nights, and irritability. Do us all a favor and listen to your body before you get to this point. What was the best running advice someone gave you? Great advice for new runners! Great tips! I've never been much of a runner. This past year I've gone through quite a bit and have let myself go a bit. Time for me to get back on the ball and get my a** back in gear! Can't believe I've fallen off so much. Been taking a look at fitness blogs and reading stuff to get inspired once again. I've even printed out calendars and written down schedules to keep track.